Summit Attendees: Must Know Information Before You Arrive in Vegas! When you attend the 2015 Global TapRooT® Summit, there is information you must know before you travel to Las Vegas. 1. PREPARATION: Review your current performance improvement program and find gaps that you would like to improve in the next 12 months. 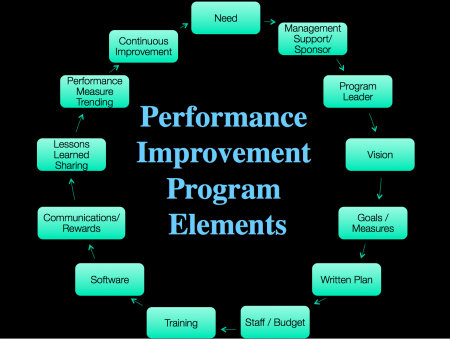 There is a diagram of improvement program elements above to get you thinking about your plan and potential gaps. Also, read Chapter 6 of your black TapRooT® Book. Hopefully, the sessions you chose to attend will help you learn valuable information that will take your improvement efforts to the next level. 3. DRESS: Pack the right cloths. Dress will be business casual for attendees and business for speakers. Also, if you are often cold, bring a light jacket or sweater. Hotel conference facilities are usually kept cool to keep attendees awake! 4. FOOD: Breakfast and lunch are supplied at the Summit and at the Pre-Summit courses. There will also be food and drink at the Wednesday night reception. 5. RECEPTION: Plan to attend the Wednesday night TapRooT® Summit Reception at Margaritaville. There will be live music, food, and drinks. It is a great place to meet and make friends. Your spouse is invited too. 6. BE ON TIME: Don’t miss the OPENING WELCOME at 8 AM on Wednesday. You will have three people looking to meet you during THE NAME GAME and a reward for completing the game. Also, you will get a ticket for a prize drawing whenever you are on time for a session. 7. CONSIDER BRINGING A LAPTOP: Some sessions have exercises that may require a laptop or tablet. Also, you will be able to log into the new software at the Thursday morning breakfast. 9. BREAKFAST ACTIVITIES: Breakfast on Thursday and Friday is from 8 to 9. On Thursday, the breakfast activity will be a Version 6 TapRooT® Software trial. If you want to learn more about the TapRooT® Software, come to breakfast at 8 AM. On Friday, there will be breakfast table discussions about a variety of topics. Arrive at 8 AM to pick your table/topic and participate in the discussion/networking event. 10. DON’T LEAVE EARLY! Friday is an important day at the Summit. The Gap Analysis Session will help you design the improvement to your improvement program in 2015/2016. And the final speaker is Captain Richard Phillips. (The real guy, not the movie actor who played him in the hit movie.) Don’t schedule your flight until the afternoon. Or stay until Saturday and have time to meet and talk with Captain Phillips after his presentation. 11. QUESTIONS? Drop us a note at info@taproot.com. Thanks for reading these brief instructions. Look for more details in the meeting instructions you will get from our meeting planner.